I was contacted recently by the owner of a Sinclair PC200 (an XT class machine in an Atari ST style case) about my XT-CF boards, wondering if a custom board could be built for the machine, with its physical 50mm height restriction on its two ISA slots. The quick answer to that is no, since the CompactFlash header is too big in either orientation, but I’d already been pondering on the idea of a super-simple PCB providing a 40-pin IDE header, based on the lo-tech 8-bit ROM board, so this seemed like a good opportunity to finish the design. Lo-tech ISA CompactFlash Board: What is it? 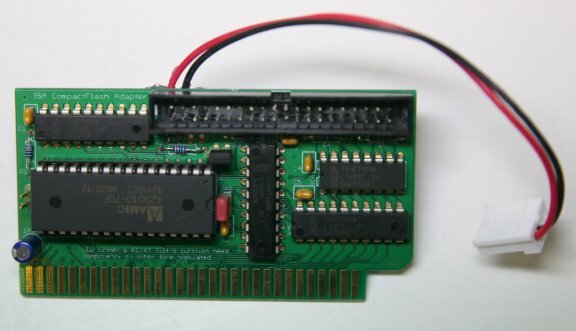 A through-hole, small form factor 8-bit ISA adapter providing a 40-pin IDE header suitable for connection to a separate IDE to CompactFlash adapter (available cheaply on eBay). By using a 40-pin header instead of a CompactFlash socket, home assembly of the device is made simple as all required components are 2.54mm pitch through-hole. Other than the small form factor (and without any provision for a slot bracket), the PCB is a standard ISA card and can be used in any PC with an ISA slot. Whilst the XT-CF-lite was based closely on the original XT/IDE adapter, borrowing directly its OR and inverter gate design to provide IDE register access and IDE reset, with this new board this has been condensed into a single 74LS139. Any CompactFlash or microdrive device should work with this adapter, and probably ATA-2 compliant hard drives (since 8-bit transfer mode is a requirement of ATA-2). I wanted to include as much functionality as possible, so implementing the logic for IBM PC/XT Slot-8 compatibility (developed with the CPLD based XT-CF adapters) was a goal. Although out of space on the ISA component side, the layout could accommodate a few SMT components on the ISA solder side: these are entirely optional, but when populated provide LED drive and Slot-8 functions. LED drive requires the SMT 74LS33D populated since CompactFlash devices provide only minimal activity LED drive current, which is likely already absorbed by LEDs on the required CompactFlash to IDE adapter. The boards are fully supported by the XTIDE Universal BIOS (from build R545), with standard 8-bit PIO transfer mode and the enhanced performance BIU Offload mode just as with the XT-CF-lite. The DMA transfer mode of the XT-CFv3 is not however supported. ENIG (gold plated) rev.2 PCBs are available via the shop page. Components will also be needed from your local electronics outlet such as Farnell, Mouser or Digikey – full Bill of Materials in the wiki. Hey, James.. I’d love one of these to put into my Tandy 1000HX. While the XT-IDE v1 fits, it’s a TIGHT squeeze. The smaller footprint of this board would go much more nicely. Thanks! I am amazed by your developments. I’m almost new to retro-computing, and stuck with hardware failures in an IBM PS/2 model 30 8086 (harddrive is borderline but floppy is al ost gone!) and a Compaq Deskpro EX 4/50 486(harddrive is dead, trying to find ISA IDE card). I would really love to get the new v1.1 PCB to try to get the IBM back to life. Please advise when ready. I am as bad with the solder as anyone can get, but recently I repaired a subwoofer KEF PSW2500, just by changing a bad capacitor. This will be a real challenge! Thanks for sharing your work and good luck. I’m interested in two of the v1.1 boards. But pardon me, how do i flash the thing? For the BIOS, you need a recent XTIDE Universal BIOS build, say r550 or newer. I’ll be posting an archive with everything pre-built within the next day or two. Hi James, I built up my ISA CompactFlash board today (including the SMT components – a first for me) and it’s all up and running great in my IBM 5155, thank you so much! I did however run into a snag with the BIOS, the Beta BIOS you have on the Lite page worked OK but I wanted to config the latest version so I built rev. 554 – unfortunately this correctly IDs the master CF but then just hangs. After looking at the SVN log I reverted to rev. 551 and this works great, so I think the recent boot/interrupt changes have caused an issue, at least for my machine. Great – thanks for posting back! Re R554, try setting the ‘IDE Adapters’ to 1 in xtidecfg.com. Also be sure to use ide_xt.bin, unless you have a V20 CPU installed. Hope that helps – do post back or on the VC forum XTIDE Universal BIOS v2.0.0 beta testing thread. The A29010 seems to be an EOL product with scarce availability. Thanks, availability of all these 5V DIP chips seems to come-and-go. The board can used any of: AMIC A29 010/020/040 or SST 39SF 010/020/040. Hope that helps! I think I found and ordered all the parts. Just waiting for everything to arrive and put it all together. eBay had CF to IDE adapters very cheaply (under $2US), and Amazon has 16gb CF cards for about $13US. Considering my first Turbo-XT in 1982 had two 13mb Hard drives, 16gb will be plenty. I plan on using Matthew Reed’s TRS-80 Emulator on my XT to have it work as a TRS-80 clone as well. If you put in a V20 (as I plan to do), which version do you use? Hi, for the V20 CPU the ‘XT-Plus’ XTIDE Universal BIOS build can be used – I’ll be adding pre-built BIOS binaries to the wiki page shortly. Just finished to build my card this morning. It is up and running now! What a great peace of hardware for my 5150! Glad to hear – thanks for posting! Finally managed to build the card and test it on my Sincalir PC200…not sure what is wrong but would like to hear it from you…or somebody who experienced the same issues…I’ve connected a 256 Mb CF which doesn’t want to boot from…after the message ‘Booting C>>C’ I receive only a message ‘Error!’….but when booting via the floppy I cann access the C and D partitions….I also did the complete Fdisk setting-up of the CF on the PC200 (via floppy boot) but when trying to boot directly from CF (C partition is primary and formatted with /s) I cannot get it through….it just stands there…. Thanks and a great piece of hardware! Try blanking the CompactFlash boot sector completely, using my WipeDisk utility, then re-partition and format. The partition needs to be marked active as well. Hi, I own a olivetti m24 (8088), will it work? Hi Federico, the reason is that the boot sector on the card is not compatible with the CPU in the machine. See here for details, basically you need to re-create the MBR using DOS 6.22 FDISK /MBR (booted from a floppy) or completely erase the CompactFlash card with WIPEDISK utility and start again. Hope that helps! Hi , many thanks ! at this point the Olivetti M24 gave the message “missing operting system” .. first message gave no sign.. good sign! Can it be used with a AT 286 and 386 or can i just connect a CF to IDE converter to my existing 16bit ISA IDE controller?